I can safely assume that anyone who's ever uttered "dolls aren't scary" did not grow up with a sister who played with dolls. Not Barbie, mind you, but dolls: those of plastic skin, life-like faces, rabid eyes, and ratty hair. The creators of Child's Play understand the unnerving--if a bit absurd--fear of once stagnant eyes slowly moving across a room. Or a plaything exercising its limbs... without any batteries. The film intelligently explores one of the basic foundations of this primal fear: if a toy comes to life, who's going to believe it? This basic element elevates Child's Play above many of its contemporaries. It isn't about a masked murderer, or how you stop an unstoppable killer (well, until the last 5 minutes or so); it underscores its carnage with a sense of helplessness that's rare in most slashers. The film begins as Chicago serial killer Charles Lee Ray is hunted by the police. After a bloody encounter, Ray finds himself cornered in a downtown toy store. Using some kind of movie voodoo, the killer transports his soul into a "Good Guy" doll and escapes his would-be captors. Of course, the "Good Guy" is the hottest toy of the season. And it's the only thing youngster Andy Barclay wants for his birthday. His mother (a wonderful Catherine Hicks) can't afford the doll's expensive price tag. Lucky for her, but not so lucky for Andy, she finds a peddler who'll sell the doll on the cheap. As you might guess, it's possessed. In the opening scenes of the film, Chucky (the doll's new moniker) is a bit reserved. He doesn't do anything out of the ordinary around adults, but develops quite the relationship with Andy. It isn't long, though, before Andy's babysitter upsets Chucky and finds herself on the receiving end of a hammer. The film plays up the "boy who cried wolf" angle to a pitch-perfect degree. The filmmakers even take it one step further by making Andy the chief suspect in Chucky's morbid crimes. 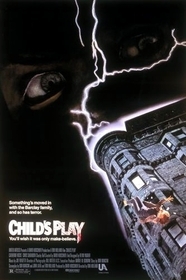 This plot point excels because it helps develop the relationship between Andy, his mother, and a detective (Chris Sarandon) so that each character is something more than a mound of flesh at Chucky's disposal. You really feel bad for the kid. The film is paced very well. It uses the Jaws "slow build" approach and saves most of Chucky's devious behavior for the film's third act. This method builds character suspense quite nicely. It also helps to make the storyline a bit more believable. Without a cleverly arranged script, I don't think the premise would've lasted two minutes in a pitch meeting. The film's performances also fall into the plus column. Catherine Hicks and Chris Sarandon go beyond the "it's only a horror movie" school of acting and turn in mature, dynamic performances. And Alex Vincent, as Andy, plays naive well. So well, in fact, it's completely understandable that the adults in the film think he's replaced childish imagination with psychopathic tendencies. 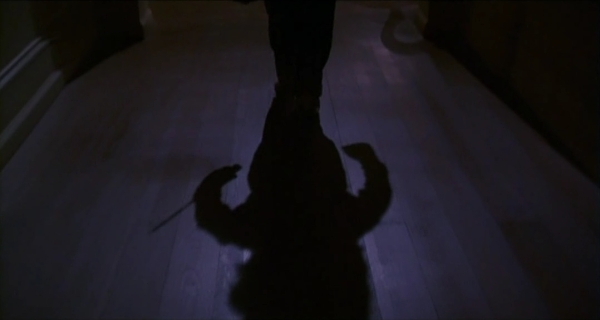 Another amazing thing about Child's Play is that it manages to walk the razor-thin line between horror and comedy. The premise is so absurd that to take it completely seriously would be a horrible mistake. Writer Don Mancini and director Tom Holland know better, and there's a nice balance between the two varying gut reactions. And some of the scares are truly effective. Observe the scene where Chucky attacks the detective in his car. Once the car is out of commission, the suspense is unrelenting and well-executed. Although Child's Play doesn't feature a budget or the level of special effects as say... a Nightmare on Elm Street film, it manages to be surprisingly scary and inventive. 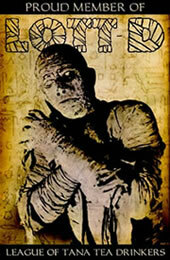 It's a fast-paced ride through childhood fears that linger deep within. And it's an effective little film, to say the least. Without its sloppy, dragged-out conclusion, it would be a near perfect horror film. As-is, it gives you everything you'd need for a thrilling Saturday night at home. Just lock up any dolls you might have lying around, eh?